"Corinne Michaels is a master storyteller!" 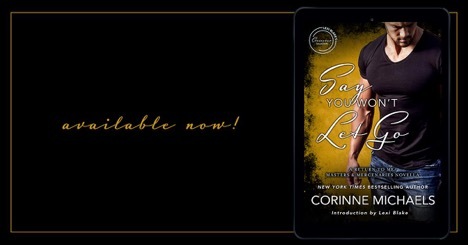 Say You Won’t Let Go, an all new Return to Me/Masters of Mercenaries crossover novella in The Lexi Blake Crossover Collection by Corinne Michaels is LIVE! She was doing it. She was on her way, until Cooper Townsend landed backstage at her show in Dallas. This gorgeous, rugged, man of few words was one cowboy she couldn’t afford to let distract her. But with his slow smile and rough hands, she just couldn’t keep away. With outside forces conspiring against them, Cooper hires the McKay-Taggart team to protect her. Emily refuses to let Cooper get hurt because of her. All she wants is to hold onto him, but she knows the right thing to do is to let go . . .
Read Say You Won’t Let Go Today!